PHILLIES LOOKING LIKE THE CLASS OF 2019 NL EAST! Phillies opening day is just five days away — Thursday, March 28 at 3 pm at Citizens Bank Park. And after a successful offseason, the Phillies are picked to win the National League East. No team loaded up this winter like the Phillies. They broke records with their 13-year, $330-million contract for Bryce Harper. They won the sweepstakes for catcher J.T. Realmuto. They also added shortstop Jean Segura, outfielder Andrew McCutchen and reliever David Robertson. Kept out of the playoffs since 2011, they might be the favorites to win the East. 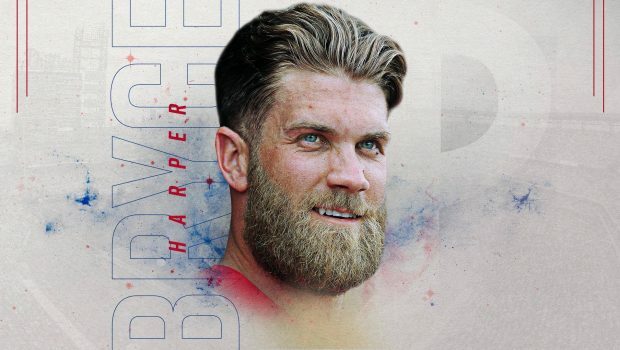 The perpetual underachievers, unable to get past the first round of the playoffs since moving to Washington, were undaunted this winter when facing Bryce Harper’s departure. The team responded by doling out $140 million to pitcher Patrick Corbin, while acquiring catchers Kurt Suzuki and Yan Gomes to shore up their receiving. They still boast phenomenal talent in pitcher Max Scherzer and budding star outfielder Juan Soto. The arrival of new general manager Brodie Van Wagenen, the former high-powered agent with CAA, infused life into the wayward franchise. Van Wagenen retooled the roster over the winter, adding all-star closer Edwin Diaz and second baseman Robinson Cano in a trade with Seattle. With Jacob deGrom and Noah Syndergaard headlining their rotation, the Mets will try to ride their pitching back into the playoffs. The Braves surprised the industry by winning 90 games and the National League East in 2018, buoyed to the top of the division by the emergence of National League Rookie of the Year Ronald Acuña Jr. Despite the success, the team largely stood pat this offseason as the rest of the East loaded up. Outside of a one-year contract for former MVP Josh Donaldson, the Braves are banking on repeat performances from their young players. Under the leadership of Derek Jeter, the Marlins remain in a perpetual rebuild. The latest star to be shipped out of town was catcher J.T. Realmuto, who joined an exodus begun the previous winter with the trades of outfielder Giancarlo Stanton and Christian Yelich. Former Dodgers manager Don Mattingly must prepare for another season in his division’s basement. Previous ACE IS HIGH: PHILS AARON NOLA CAN’T WAIT FOR THURSDAY’S OPENER! Next EAGLES ‘FELT RIGHT’ FOR VINNY CURRY’S HOMECOMING!